Project update 15: Mango carnage season! It’s mango carnage season in Tioman!!! This matches up with our exit counts – which are a technique of counting the bats as they fly out of their roosts in the evening to forage for food. 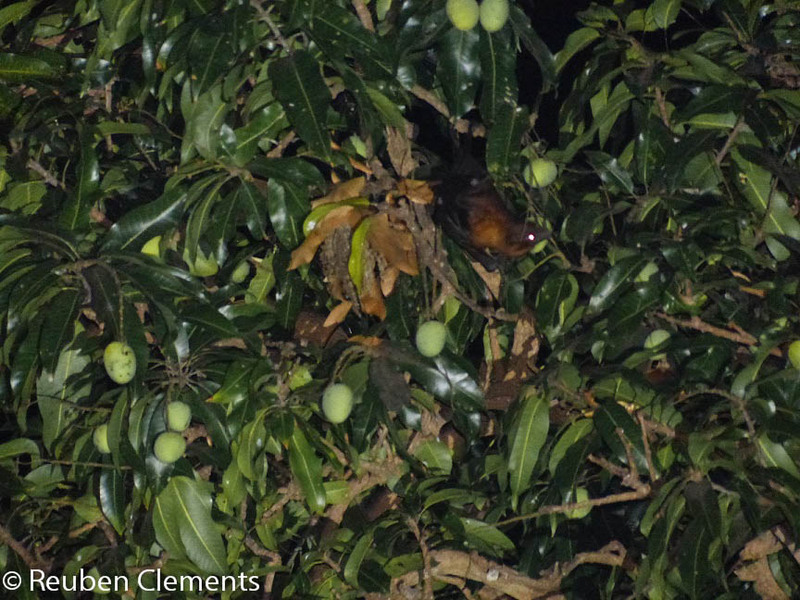 In March, when no mango trees were fruiting, we counted more than 800 bats flying out every evening. This time, only 200-300 bats flew out, suggesting that most of them are choosing to stay closer to home because there’s such an abundance of accessible food resources. 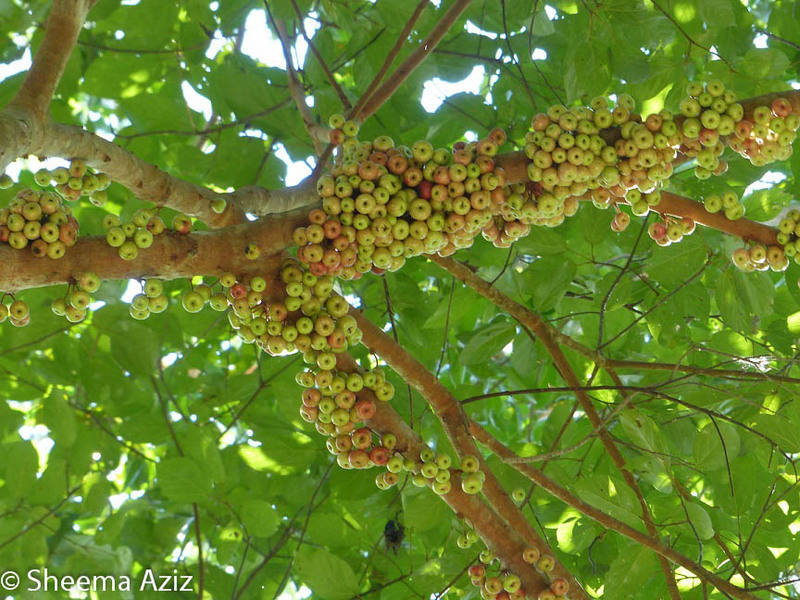 Apart from mango, other cultivated trees we spotted in fruit were cashew (‘gajus’ in Malay), water apple (‘jambu air’ in Malay), key lime (‘limau nipis’ in Malay), sapota/sapodilla (‘ciku’ in Malay), pineapple (‘nanas’ in Malay), starfruit (‘belimbing’ in Malay) rambai and rambutan; plus we saw that some durian trees were fruiting while others were in flower. So it’s a veritable spread where the bats are spoiled for choice. It also looks like they’re actually carrying the mangoes and cashews back to their roosts, eating them in the comfort of their own homes – as shown by all the seeds and half-eaten fruit we found underneath the coconut trees every morning. Those are some pretty big seeds there – proving that flying foxes are definitely capable of dispersing sizes up to 76mm in length ! At the same time, we’ve pinpointed a list of potential food plants in the area which the bats might feed on – apart from the cultivated fruit trees mentioned above, this also includes several wild species as well, particularly 23 different, unidentified species of figs! We would never have been able to accomplish this without the help of Sahak, a local guide with impressively in-depth botanical knowledge. None of us are well-versed in plants – we’re still hoping some botanists will be able to make it over here soon to help us identify plant species properly in the field! 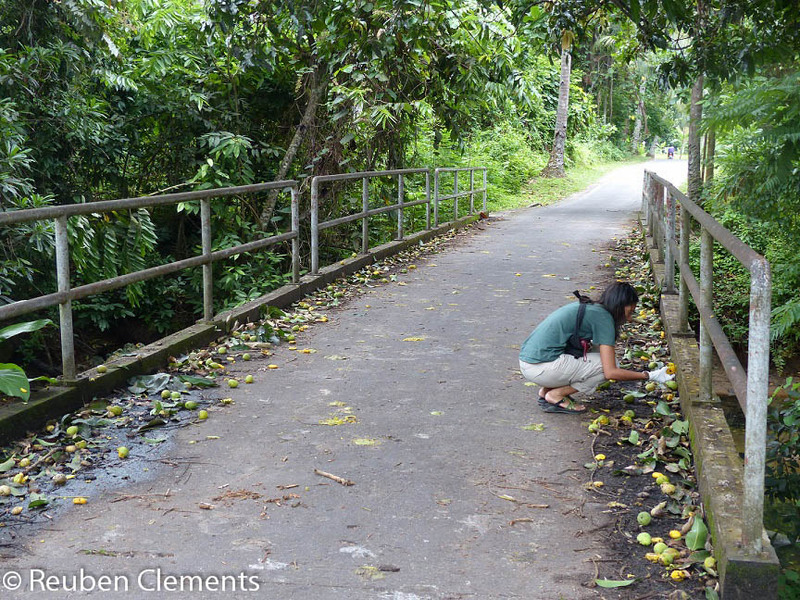 We’ve now started monitoring the phenology of all these plants to figure out when they’re in flower and fruit, and to see how this matches up with what plant species we find in the flying fox faeces. We’re also collecting samples from every plant to build up databases of plant DNA, pollen and seeds. The hope is that the project can ultimately create comprehensive libraries of these food plants (which are also important resources for other animals such as birds, primates and squirrels), which will be made publicly and freely available for other researchers to use. 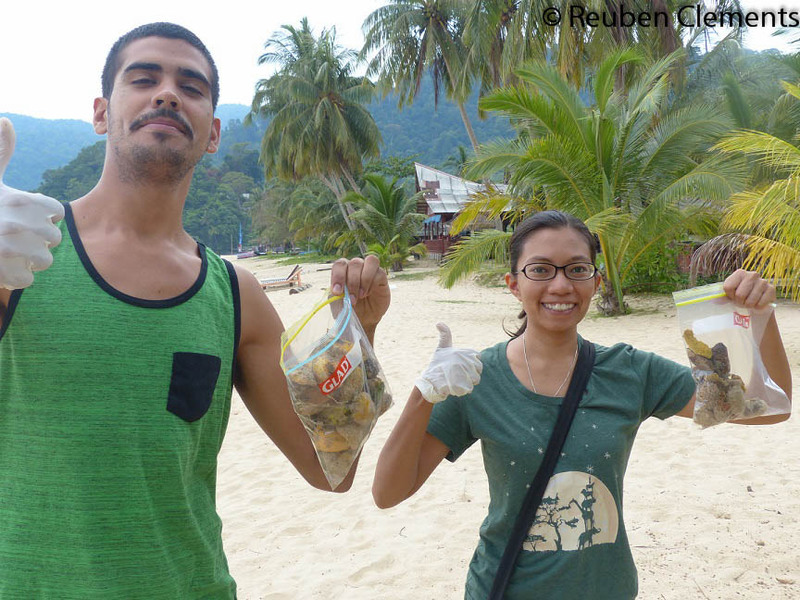 Each visit we make to Tioman has been extremely fruitful (pun intended), and every time we go back we keep learning more and more new things. This time, we could see that there are definite behavioural changes in the flying foxes, influenced by availability and seasonality of food resources. This throws up interesting issues and questions related to seed dispersal ability, ecosystem roles, human-bat conflict, even bat nutrition and health. We hope our research can help provide a start to answering some of these questions. 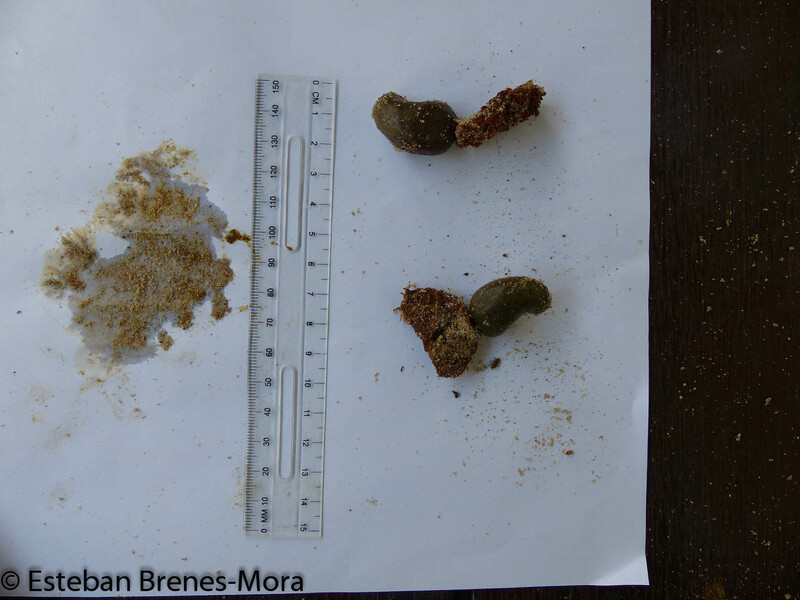 Next step is to analyse the faecal samples to see what else the flying foxes are eating – so lots of lab work trying to figure out different shapes of pollen and seeds. That’s the absolute FIRST question we need to answer!